• NAS (Network Attached Storage) products that aim at comsumer sector usually cannot be priced too highly (less than US$299), but given this price range, RAID 5 technology that can yield high disk usage is usually not available. However, this product successfully incorporates this technology using only 3 hard discs being priced at only $249. • Nevertheless, it still offers a number of functions that are available in competitive products, such as 4K H.264/H.265 hardware-accelerated decoding and real-time transcoding to enhance 4K multimedia playback across multiple devices. 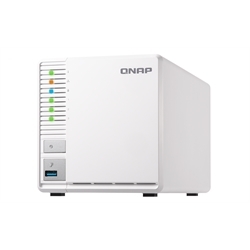 The TS-328 is QNAP's first 3-bay NAS, allowing you to build a RAID 5 array on your NAS with the fewest disks, it features a minimalist design that easily fits into your home or commercial space, and provides a highly cost-effective solution for storage, backup, file management, and sharing.